At the North American box office, the top-grossing movie released in 2009 was Transformers: Revenge of the Fallen. That sentence will self-destruct some time this month. In the early summer, Transformers 2 steamrollered all competition on its way to becoming only the ninth movie in history to earn $400 million at the domestic box office. Then, as if not just in response but rebuttal to this mass-produced entertainment, came Avatar, the James Cameron sci-fi spectacular that has earned $350 million in its first 2½ weeks and, in about the same time, should overtake the Transformers sequel. It has already passed the billion-dollar mark at the worldwide box office (Transformers 2 topped out at $800 million), quickly becoming the fourth highest-grossing all-timer after the second Pirates of the Caribbean film, the final Lord of the Rings installment and, at the top, a little love story called Titanic. The ultimate face-off of Cameron vs. Cameron is still down the road. But in 2009's cosmic economic battle of extraterrestrials  the Autobots and Decepticons of the Michael Bay movie and the Pandorans of Cameron's  the blue people will soon triumph. This may not have been the time to expand the Oscar category for Best Picture from five films to 10, but studio bosses will say it was a very good year. No matter what else Americans skimped on when they got slammed by the Great Recession, they didn't stop going to the movies. For the first time ever, the annual box-office total exceeded $10 billion ($10.5851, to get into pi calculations), outpacing the previous record, in 2008, by nearly 10%. The number of tickets sold, 1.474 billion, was the highest of the past five years  though lower than sales in any year from 2001 to 2004, when the big franchises (Star Wars, The Lord of the Rings, Spider-Man, Shrek, Harry Potter) were really cooking. Inflation explains the variance between dollars earned and tickets sold. Ticket prices keep rising; and with Avatar charging road-show fees and getting away with it, look for Hollywood to keep following the Starbucks model: persuade the customers that your product is premium, and charge them for the privilege of buying it. It happens  or was it inevitable?  that the top three winners were also the year's most expensive movies, costing between $210 million and $250 million, not including the cost of bringing them to market (usually another $100 million or so). Studio moguls are always looking for ways to tamp down runaway budgets, but they may have to acknowledge that money on the screen equals money in the bank often enough to take the risk. The worldwide popularity of these über-movies also suggests that smaller pictures will have a harder time getting made. That trend is already evident: the industry earned its big boodle in 2009 while making about 20% fewer films. And which were the big losers? Expensive duds are harder to calibrate; for example, a film may disappoint Stateside and be a hit abroad. Still, it's a Hollywood rule that movies with $100 millionplus budgets should at least earn as much at the domestic box office as they cost to produce. If they didn't in 2009, they made our top-of-the-flops list. The underperforming nine: Terminator Salvation, Disney's A Christmas Carol, G.I. Joe, Angels & Demons, Watchmen, The Taking of Pelham 1 2 3, Public Enemies, Land of the Lost and Where the Wild Things Are. Note that, of the directors of these nine flops, four were either Academy Award winners (Robert Zemeckis, Ron Howard) or Oscar nominees (Michael Mann, Spike Jonze), whereas Cameron is the only Oscar winner among directors of the top 10 grossers. The lessons: prestige directors get to spend more money, and, in dollar terms, their "personal vision" can look astigmatic to the mass audience. (And great to critics, who put the Mann and Jonze films on their 10-best lists, and would rightly fret if big-budget assignments went only to hacks.) Consider, too, that none of the first seven of the top 10 grossers had traditional stars; but the loser list featured the likes of Jim Carrey, Tom Hanks, Denzel Washington, John Travolta, Johnny Depp and Will Ferrell. The lesson, which Hollywood should have learned by now: $20 million salaries  star wattage  don't always metamorphose into box-office heat. Up and down the movie money chain, that rule applies. In medium-budget films, stars and directors with hits in their past can take disastrous oversteps. In 2009, reliable comedy stars such as Adam Sandler and Jack Black headlined fairly pricey pictures (Funny People, Year One) that went doggo; Sacha Baron Cohen tried to parlay his Borat success with the more acerbic Brüno, and what did the audience do? Pranked him. Ferrell's Land of the Lost cost $100 million to produce, and took in less than half that domestically. The flop bug bites art-house directors too. Ten years ago Ang Lee spent $15 million to make Crouching Tiger, Hidden Dragon and had a $127 million winner; in 2009 he spent $35 million on Taking Woodstock, which grossed just $7.5 million. Meanwhile, The Hangover  another no-star comedy about drugs and larceny, also costing about $35 million  was the year's top-grossing comedy. The Hangover was out of nowhere; Sandra Bullock was out of the past. After nearly a decade without a solid hit, she starred in The Proposal and The Blind Side. Combined budgets of the two films: $69 million. Combined domestic gross: $375 million. At 45, she's Miss Congeniality again. Do Big Movies Have to Be Pringles? That's the gambler's fun of the movie business. Roll the dice once and you get a Paranormal Activity ($15,000 budget, $150 million worldwide gross). And if you've really got the nerve, follow the example of Roland Emmerich, the master of cheesy disaster movies (Independence Day, The Day After Tomorrow). He offered studios a take-it-or-leave-it deal on his world-ending 2012. Some turned it down; Sony bought it, on Emmerich's terms. In less than two months the picture has earned nearly $750 million worldwide, and Emmerich stands to pocket $100 million  proving once more that Hollywood is the art of the deal. A studio boss once described a good movie as "one that people go to see." Does that tautology make Transformers 2 a great movie? A lot of film critics  and even some real people  saw the film's popularity as some triumph of the clones. It's not that the killer-toy action adventure was a bad movie, though it was, but that it amassed its fortune almost by rote, as if its title alone, promising to duplicate the automaton thrills of its predecessor, justified laying down money for it. 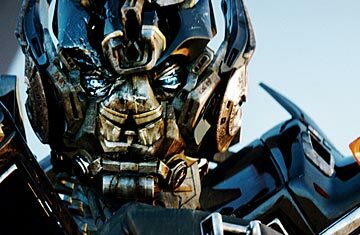 Transformers 2 didn't enter the national consciousness; it anaesthetized it. Nobody buzzed about the movie, but everybody saw it. The industry, it seemed, had finally figured out a way to mass-produce blockbusters. Pringles pictures on the grand scale. Say this for Avatar: it has passion and ambition and a daffy, almost heroic, dead seriousness. Which is to say it's one megabudget Hollywood epic that feels as if it was made by a human, not assembled by cyborgs. Maybe some of the folks paying inflated prices for the 3-D IMAXed Avatar are doing so out of social obligation to see what they've heard the rest of the world is seeing. But what they're getting is a personal vision. Not a religious experience; rather a mass hallucination  an elevated, persuasive fiction, a thing that can't be but is, right before our eyes. And that's what movies are at their best. Avatar is already the highest-grossing really good movie of all time (in current dollars). If other powerful writer-directors can get the kind of financial support Cameron did, and make the auteur-audience connection he has, then 2010 and the years beyond it could be worth watching  not just for the numbers, but for the pictures. Read who will go home with an Oscar. See the top 10 movies of 2009.